I haven’t ever come across a web-based tool that’s anything quite like Edji.it. This is new territory in the world of EdTech, and I like it. As you can tell from the title, Edji.it is a brilliant tool for close literary analysis, and the content you analyze can really be anything. You can create your own readings, copy/paste from other sources, and even include images and PDFs. In addition to being able create an in-depth close read and easily share it with your class, thoughtful and purposeful annotations can be made in the form of highlights, text comments, and even emoji reactions. As the admin, you import or create the text. That’s done very simply by clicking the “New Reading” button and inserting text (which you can format.) You can also insert images and even PDF’s – all of which can be annotated. When you’re satisfied with the text, you save it as a draft and finally hit “share”. It creates a join code (also called lightning code) for your students. They, in turn, access your text by going to the edji.it main dashboard and typing in the simple code where it says “Join”. A simple join code for the group is all your students need! This is where it gets really clever. As each of your readers are doing their own text analysis, their comments are private only to them. You, as the admin, have a handy toolbar on the left that lets you see how many users are accessing the piece, and you can open your “feed view” sidebar that shows you all comments/annotations from all users. The neatest feature in that toolbar is something called “Heat Vision” – when you click on this, it allows all users to see all annotations. It’s the ultimate instantaneous, simultaneous sharing button. Imagine the in-depth class discussions that can ensue based on this diverse collective annotation! I taught Literacy for years, and I adored it! I loved being able to teach all of the nuances and sub-skills that went into the understanding and synthesizing of various texts. As any Literacy teacher knows, the obstacles and points of confusion are different for every single student on every different piece of text. Students may struggle with vocabulary, colloquialisms, understanding irony, theme, tone, or even just decoding. With a tool like edji.it, a teacher has a remarkable looking glass into the insights, reflections, and understandings of every single student. Would you like to try it from the “student view”? Feel free to use my join code (jbvn) and play around with the text and emoji commenting. You’ll see how easy this is for your students! Any teacher of Literacy and especially content area literacy will want to explore this clever tool with small groups (I really love this for Special Ed and ELLs) and even as a whole class. It can be assigned for homework, and tracking/data is automatically saved as long as students enter their real names (or student ID numbers). Edji.it is a winner for sure! You can also follow them on Twitter at @edjinotes. As always, I love to hear feedback and learn from you as you use the tools I share. Please leave comments here on my blog, on my Facebook page Innovation Integration, or find me as @kerszi on Twitter! 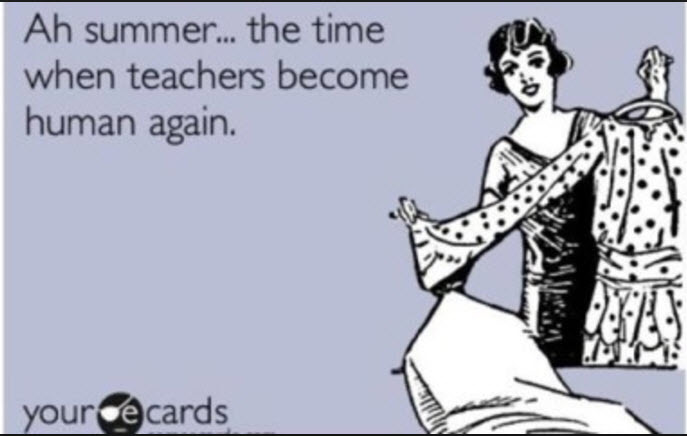 My fellow teachers, you have a few months “off”. Yes, I know that you still work. 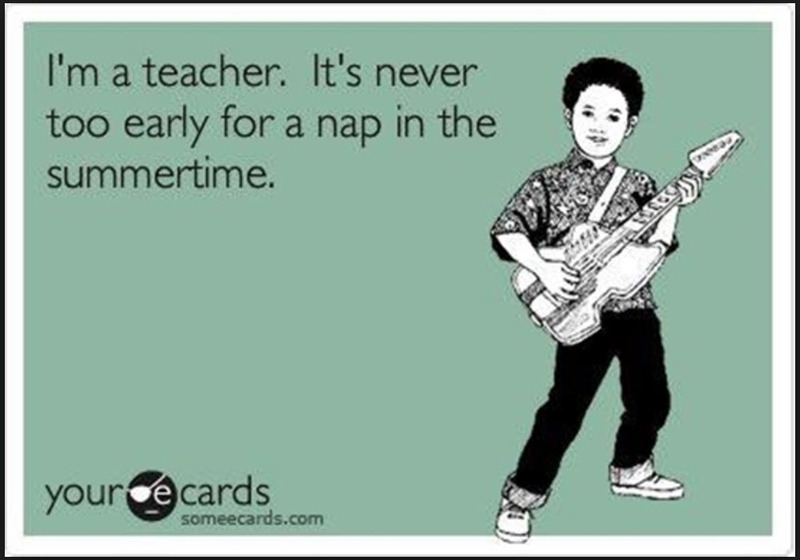 We do…we just do…because we’re teachers and we’re addicted to our craft. But this is also an important time for you. It can’t be all work – or even thinking about work. You’ve got to find time for you so that you can be your best for the students when school starts again. Take time to rejuvenate, refresh, and have fun! 1) Nap. For the love of all that is good and healthy, take some dang naps! Lots of them. Every day, if you can! I know that the title of this post mentioned the word “fun”, and believe me, naps are fun. YOU will be more fun if you take naps. 2) Read: Read fun stuff, read sleazy stuff, read fiction and science fiction and gossip magazines and classic novels if you want. “Binge read” an author that you love or go through every “beach read” that’s recommended this year. Don’t bulk up your summer with gobs of professional reading. There is a time, there is a place – it’s NOT the summer. 3) Scavenger Hunts: Don’t wonder why that’s included. Trust me. They are fun to make and fun to play. Get your girlfriends or the neighborhood couples together and do a few of these this summer. Put ridiculous items on there, or have a photo scavenger hunt. Pinterest is your friend, by the way, because there are gazillions of cool ideas to make fun scavenger hunts. 4) Make: This is purposely generic. The idea is to tap into your creative spirit and make something that you’ve never made before. Do NOT make classroom things. Make things for your home, Christmas gifts, art, food items, or lovely knick-knacks for your yard. Get out some power tools, paints, hot glue guns, scrapbook supplies, knitting needles, a soldering iron, a pottery wheel – and don’t hide behind the excuse that you’re not creative. Everyone can make SOMETHING! Be determined that before summer ends, you will have created at least one neat, new thing that brings joy to you or somebody else. 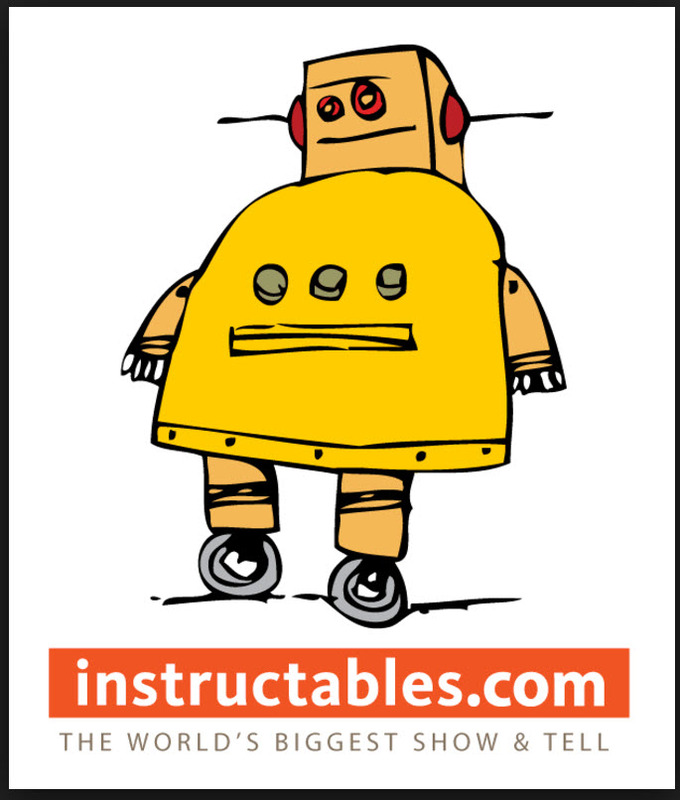 If you need ideas, walk around a craft store or check out this cool little website: Instructables. 5) Photo Fun: Whatever you are doing, capture it in photos. Even if you don’t have a big vacation planned, you can purposely go on photo walks to relax and find joy in things around you. Take a nature walk and only take pictures of things that are NOT green. 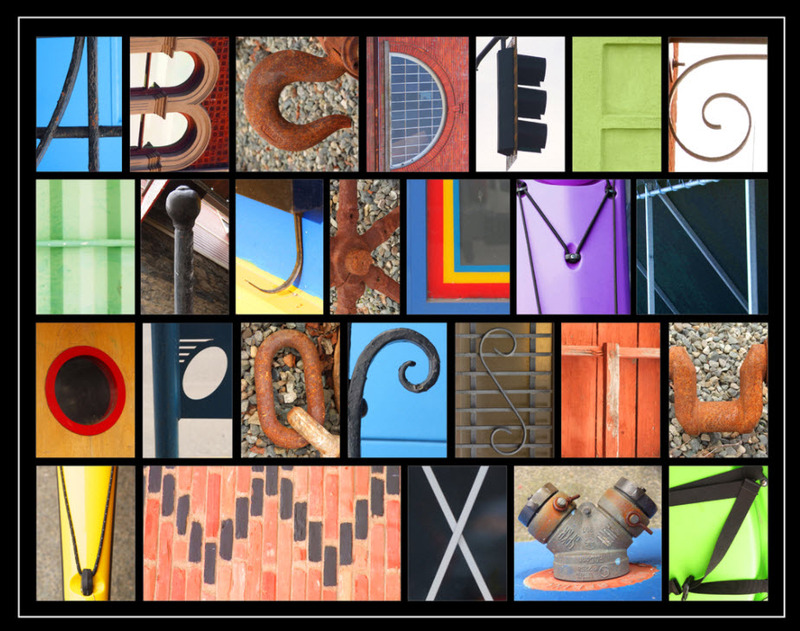 Try to photograph the alphabet in everyday objects! Have alliterative photo days: capture sunrises, smiles, snowcones, swimming pools, spaghetti, slugs, sycamore trees and anything else that starts with the same letter! Get zoomy- take really, really close up pictures of everyday items (or in nature) and marvel at the details! When you have good photo collections and are feeling inspired, play with a few apps like Aviary, Prisma, or PicCollage that allow you to edit photos or turn them into works of art. Print them out or just share them on social media! You’ll feel a good sense of pride, and probably a sense of zen with your new artistic photographic talents. Plus, when school starts back in the fall, you’ll have a whole collection that proves just how much fun you had in the summer! Thanks for stopping by! I’m @kerszi on Twitter, and I also have a Facebook page called Integration Innovation. I’m not sure if or why you might have a use for something like this, but I had a little fun playing with it tonight, and it’s just pretty entertaining. It’s a website called Clash. You type in a short paragraph or phrase and it takes each word and links it to an audio clip of the famous song or speech. Then it strings all the words together into sort of a spoken/singsong-y audio file like THIS. Clash might be a fun way to engage students. You might use it as an attention-getter at the beginning of a lesson. Maybe you’ll let students practice summary sentences using Clash. It might be a fun way for students to try using content-area vocabulary words in sentences. How else might you use this site? I’d love to hear your thoughts! Want to hear my final thoughts on Clash? Click HERE. Even if you haven’t started using them, I know you’ve seen them. And if you HAVE started using them, you’re a little addicted, right? Or is it just me? Bitmojis are taking over the world…or at least it seems that way…and I’m glad because they make me really happy! 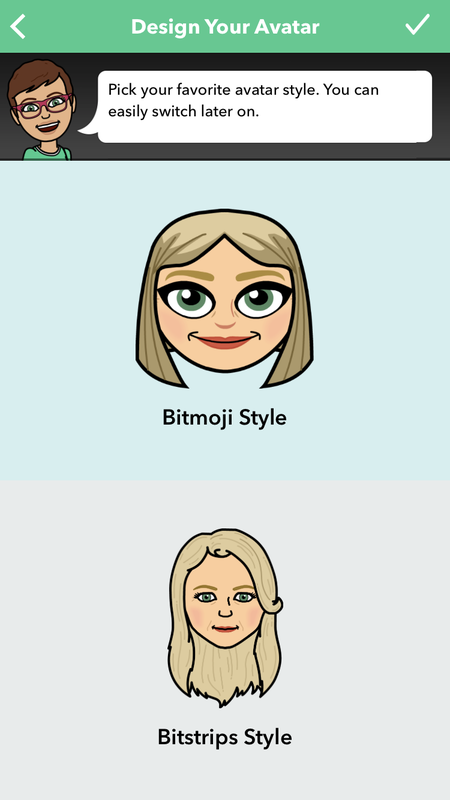 So what’s a Bitmoji? It’s an avatar you design to (sort of) look like you. And then you use it. For everything! 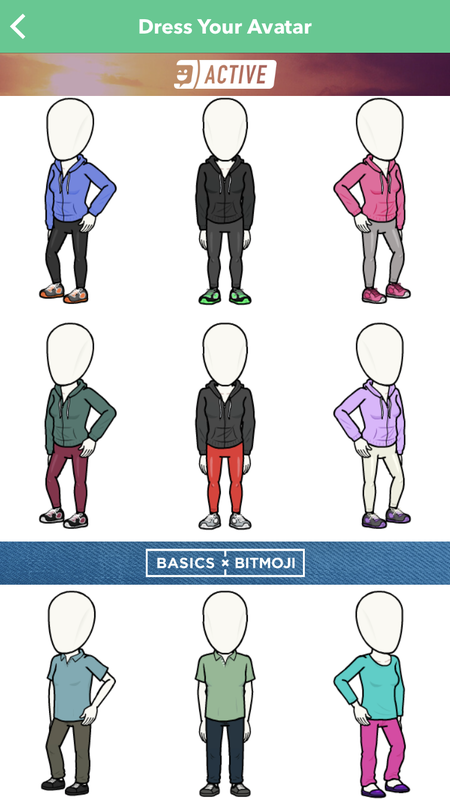 It’s personal preference, but I really like the Bitstrips style. The next several prompts will take you through designing the physical appearance of your avatar. It will ask you to choose your hair style, color, face shape, eyebrow style, eyebrow color, eyes, eyelashes, pupils, nose, mouth, cheeks, facial lines (yes, sadly yes), makeup, glasses, headwear, and finally body shape (mine is uhhh…slimmed down). Ladies, it’s even going to let you choose your chest size! Then, it’s fun fashion time! Dress up your mini-you! 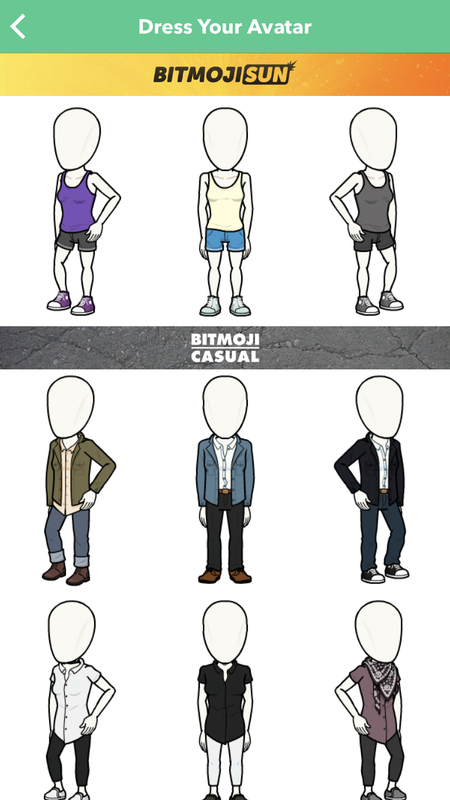 You get to dress up your avatar, but there are tons and tons of choices, and just know that you can change your avatar’s outfit as often as you’d like. 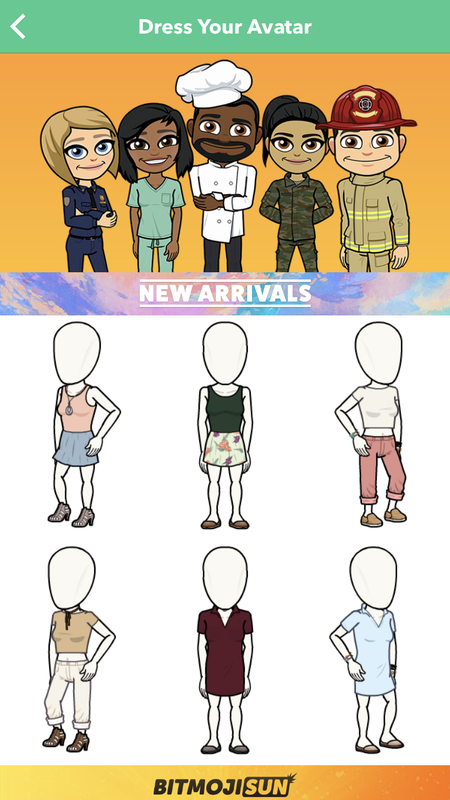 Hit the ✅ to finalize things, and you’re ready to use your Bitmoji and fun and creative ways! 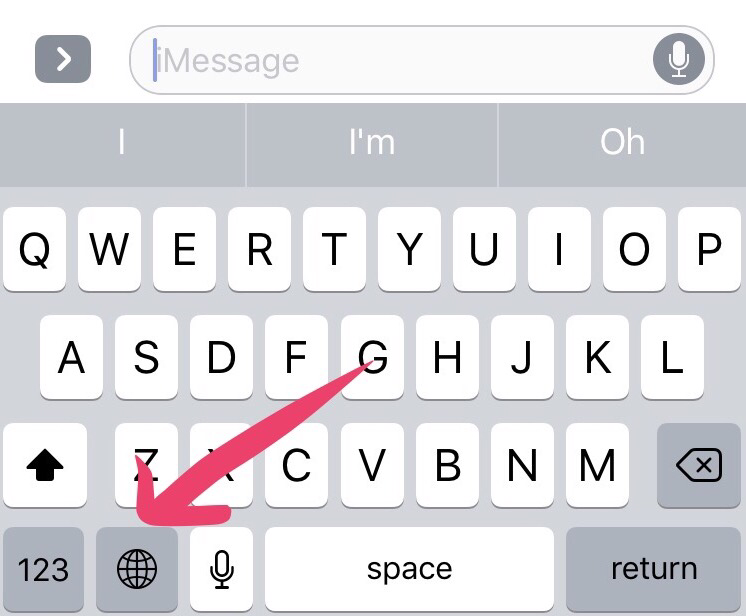 I use mine all the time when texting my husband and son. It’s become a bit of a fun game for us – we try to have entire conversations back-and-forth using only Bitmoji! 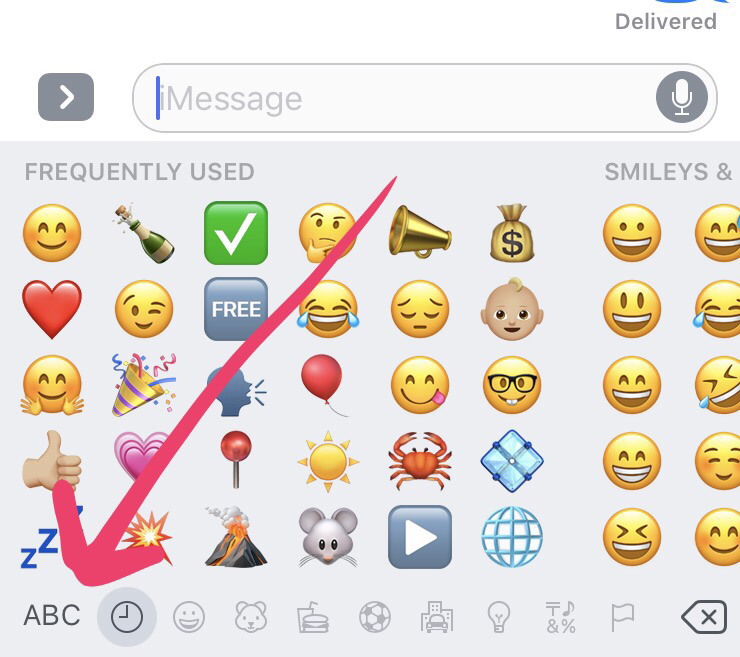 That brings up your “Search Bitmoji” screen, where you can type in keywords to look for the perfect action, expression, or emotion! Posting your fun & crazy avatars works exactly the same way on Facebook, Twitter, etc. 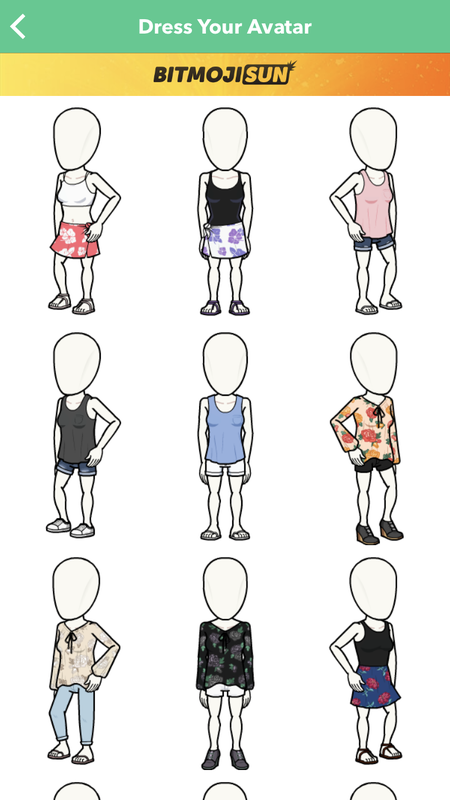 Notice my avatar has that same pink top on in most of the choices. It will stay that way until I change her outfit! 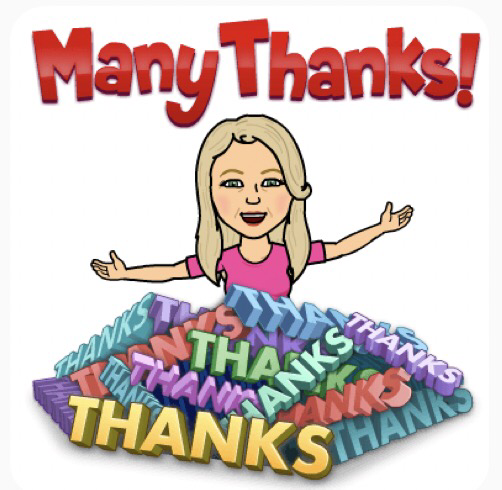 Many educators are now using these in Booksnaps (click on the word for more info), an awesome idea created by Tara Martin for using Bitmoji in purposeful educational ways! 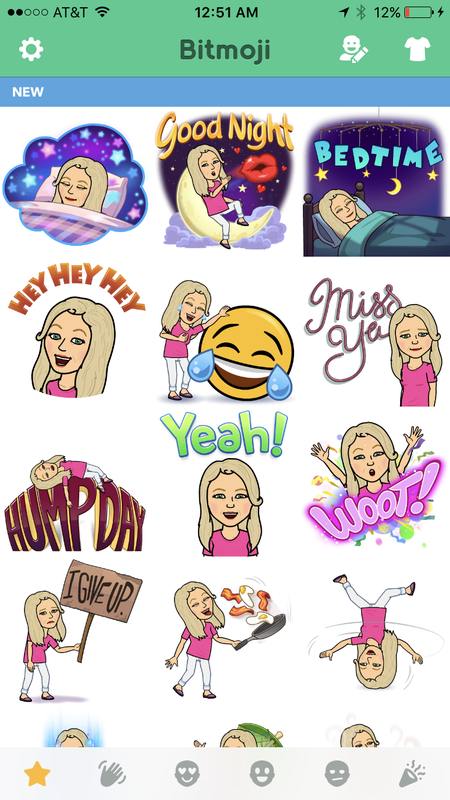 One last word of caution for elementary educators…there are a few Bitmoji that are not quite appropriate. There aren’t many, but you know your kiddies will find them! Please share your thoughts, feedback and ideas with me here at my Integration Innovation blog, on Twitter @kerszi, or on my Facebook page called Integration Innovation. Schedule Meetings with Consideration for your Team…with Doodle! There’s a really cool, simple, and free little web tool called Doodle that you’re just going to love. It’s like a scheduling agent – but it’s a very thoughtful one! Doodle lets you poll the people you want to meet with and gives them the gift of choosing the dates & times that work best for them. I have used this so many times with my various teams, committees, and staff – and I know that they appreciate having a voice in when a meet-up will occur. I’ve noticed some administrators have begun to try Doodle, too, and I applaud that effort, because educators (and other administrators) REALLY love it when they feel that their time is respected. It couldn’t be simpler. You, as the organizer, just list all the potential days and times that you’re willing to meet. Doodle puts them on a grid and gives you a link that you send to anyone you’d like to invite. People respond by entering their own names and putting checkmarks next to all of the times that they are available. You’ll get an email each time someone responds, so you’ll know when all the ‘votes are in’….and boom – majority wins! Doodle even lets you integrate your calendar, so the final meeting date is inserted for you. I told you it was easy! Just for fun, I created a quick little video tutorial (less than 6 minutes is always my rule for ALL tutorials)…Click HERE to see it! Doodle away, my friends! Do you have feedback or ideas? Please share with me here in the comments section of my blog, on Twitter at @kerszi, or I have a Facebook page called Integration Innovation, and I welcome your thoughts there, too! Thanks for reading!